How to upoad log files? Click the triangle button near the top right corner of DVDFab 10 > Click Open Log Folder (Default location: C:\Users\User Name\Documents\DVDFab10\Log); click the info button behind the source title at the main interface of DVDFab 10 > click the “Export Source Info” at bottom right corner of the popup window to save the info as a .7z file; zip all the files with WinZip or other similar tools to upload. 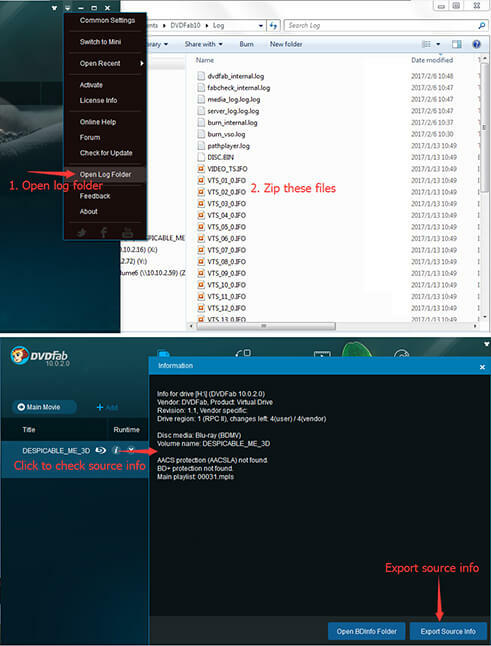 Open the default log folder by visiting C:\Users\User Name\Documents\DVDFab Passkey\Log, and then zip all the files there with WinZip or other similar tools to upload. DVDFab Team offers multilingual supports via E-mail, customers who write to us in English, German and Japanese will get feedbacks within 48 hours, while others within 2 to 7 business days. If you can’t receive the email you expect due to some reason, please then try to turn to Facebook for help. To prevent us from spam, please use our contact form.